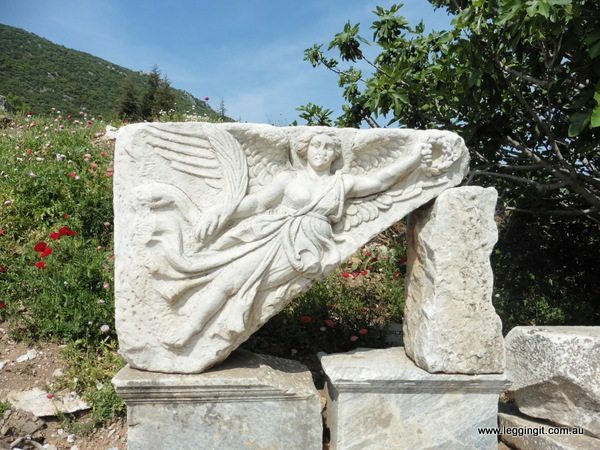 Ephesus is an Ancient city of both Greek and Roman origin, it has lots of interesting history and intact ruin so is a great place to spend a day. 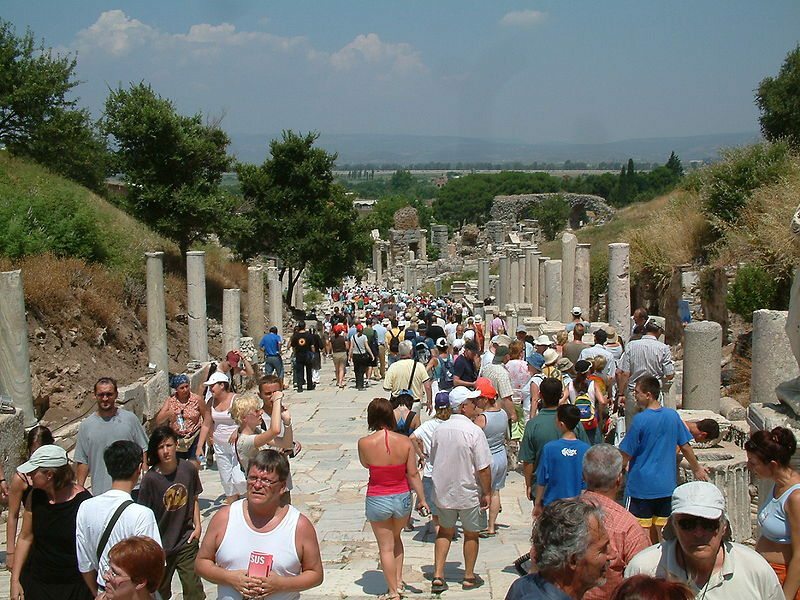 There are lots of tips around on what to do in Ephesus in one day…here are our ideas. 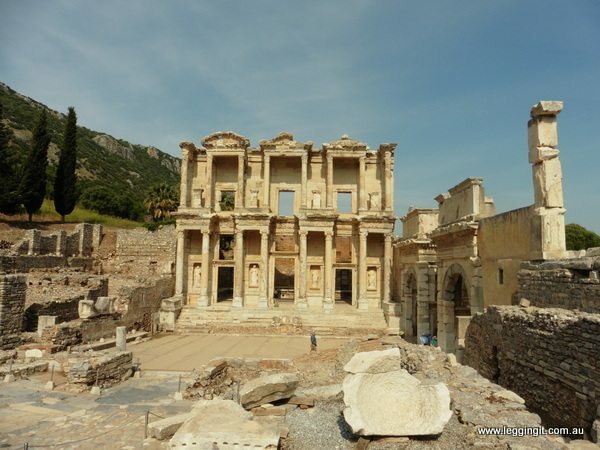 There is a lot of debate about how big Ephesus actually was during Roman times, Rick Steves, in his audio guide, describes it as’ the second biggest in the Roman empire after Rome, with a population which may have reached 250,000′. However, others say the figures are exaggerated and there were more likely only about 58,000. 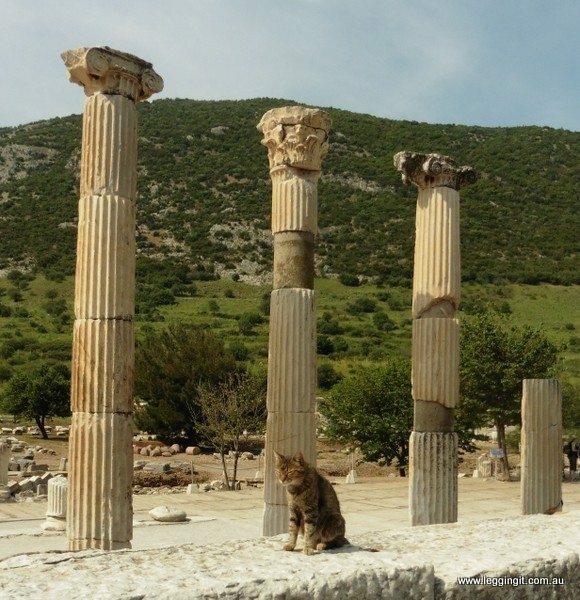 Ephesus was the location of the Temple of Artemis, one of the seven wonders of the ancient world so it must have had some attraction. Own Transport: If you have your own transport like us, there is really good signage all the way from Kusadasi, we turned off the main road, just past the Adnan Menderes Airport and arrived at the lower car park. After parking the bike and paying admission of 40 TL ($20AUD) we headed for the top gate. By Taxi: Kusadasi Taxis quote 45 Euros on their site for a return trip-ask them to drop you at the top gate and pick you up from the lower gate to save climbing back up the hill at the end of your time there. Dolmus (Mini Bus): Adnan Menderes Cad in Kusadasi, is the starting point, you need to look for the Dolmus to Selçuk. Costing 11TL, they run very frequently and they take about 30 minutes. However, they only take you to the taxi rank about 1.5 km from the entrance. From here you can walk or take a taxi for about 15TL- again ask to be dropped off at the top gate. Take a Tour: Some of the tour options are shown below. Start at the top gate: Our research on various sites, showed that the best option was to start at the top gate and work your way down through the ruins. It was really good advice as we were heading downhill and by the end of the day, the thought of walking back up the hill was not a nice idea. Get there early: The gates open at 8 am so if you can be there when it opens you may avoid the crowds and the heat of the day. Even in Winter, it can get quite warm there. We arrived quite early but already crowds of bus tours streamed through the gate and down through the marble-paved roads as we slowly picked our way through the ruins. Take plenty of water and food: There was really not anywhere on site to get this that we noticed. Audio Guides: We used a free Rick Stein’s Audio Guide you can download here We found it covered everything on the site we wanted to see and learn about. There are audio guides available from the entry for a price, I understand they are very good as well. We were also given a map on entry to help find our way around which was helpful when we had to skip places because of large tour groups. According to legend Androklos, a Prince from Athens had to leave after the death of his father, King Kadros. An oracle guided him to the Arzawan capital where he drove off most of the Carian and Lelegian inhabitants before claiming it. Androklos became successful in uniting the 12 cities of the Ionian league and under him, Ephesus flourished. 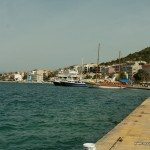 When Ephesus was established it had a fine harbour only 3 km’s from the city which the Küçükmenderes River flowed into (the Küçükmenderes which would change course so frequently it’s supposedly is where the English word meander comes from). 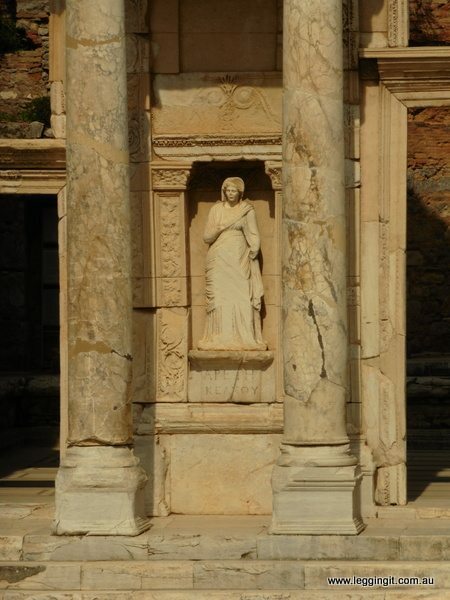 Ephesus traces its origins back to the Attic and Ionian Greek colonists of the 10th century BC. What remains today is mainly a mixture of Greek and Roman architecture, but as always new civilisations reuse what it there and add their own touches. Ephesus was a perfect location situated amongst hills with a sophisticated water supply system and four aqueducts supplying water to the city. The water powered water mills and also sawmills which cut marble slabs for use around the city. The richer people had water plumbed to their houses whereas the poorer people drew their water from the public troughs. One thing everyone could afford it seems was a bath. Around the city were a few major bath complexes where a bath would cost just a small coin. Males and females had separate areas and bathhouses tended to every need. In the main bathhouse, a statue still stands dedicated to the most famous madam who ran the local brothel. 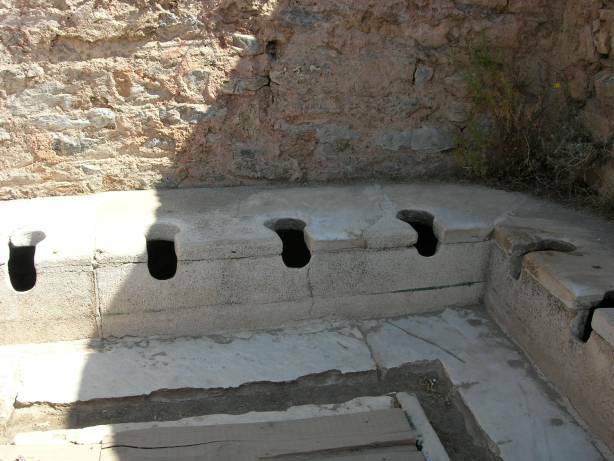 And of course, there was public toilets….no privacy here. 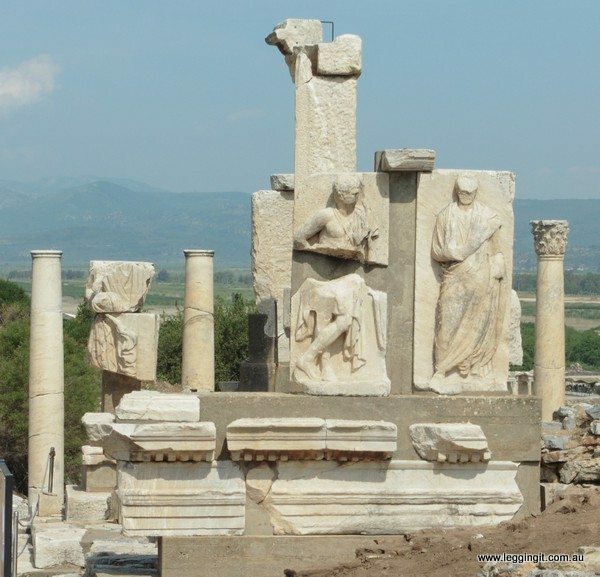 As the city of Ephesus became richer philosophy and the arts developed. 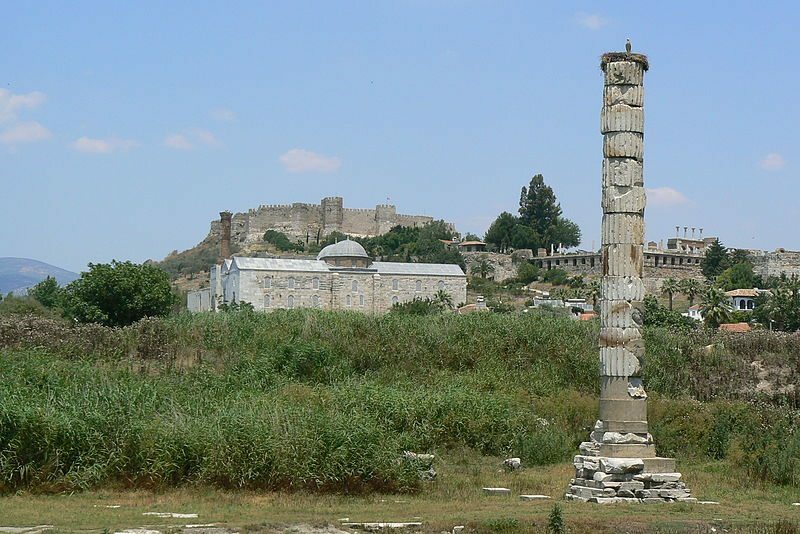 The temple of Artemis was built in 550 BC, one of the seven wonders of the ancient world. 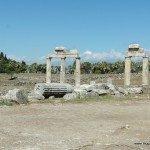 The temple was destroyed by the Goths in 268 AD and the rebuilt temple destroyed by the Archbishop of Constantinople in 401, so not much remains today. The frieze of Nike, Greek Goddess of Victory is almost intact and still quite beautiful. While we were standing there many people were discussing Nike the company and how similar their logo was. According to a guide, the company employed a graphic design student to come up with the swoosh logo for which she received just $35. Further down the city street two carved tablets one in Greek, the other in the Roman state the city’s rules. Beneath them carved into the stone are special holes for anybody breaking the rules would find themselves tied there. The Library of Celsus, situated at the end of the street before the Agora is probably the most well know of all the ruins in Ephesus. The facade of the library is stunning with two stories of columns framing four alcoves featuring statues representing the four virtues of Celsus. The Library of Celsus once housed 25,000 papyrus scrolls before the Egyptians banned the export of scrolls. It was also the place where manuscripts were written in thin layers of leather.As they were unable to roll them for storage the pages were stored flat and holes punched in the right side so they could be bound together. Hence the invention of leather-bound books. The gate next to the theatre leads to the ruins of a large agora where many of the rooms once used by merchants are still intact. Around the agora many of the columns which once supported the roof still standing. Not far away set into the hillside is the theatre which was once capable of holding 25,000 spectators. It’s a massive structure which has seen a little reconstruction work and restoration. It’s not the best theatre we’ve seen but its still pretty impressive. 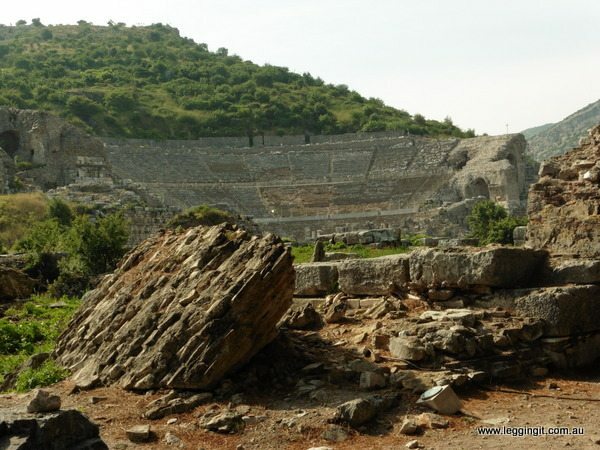 During the Greek period Ephesus open-air theatre was used for drama productions but during Roman times gladiators fought. A wall stopped those close to the action from getting splashed with blood. In recent years Sting and Diana Ross have played there. At the moment the theatre has stopped concerts whilst they investigate how to reinforce the theatre against the vibrations caused by all the people during concerts. 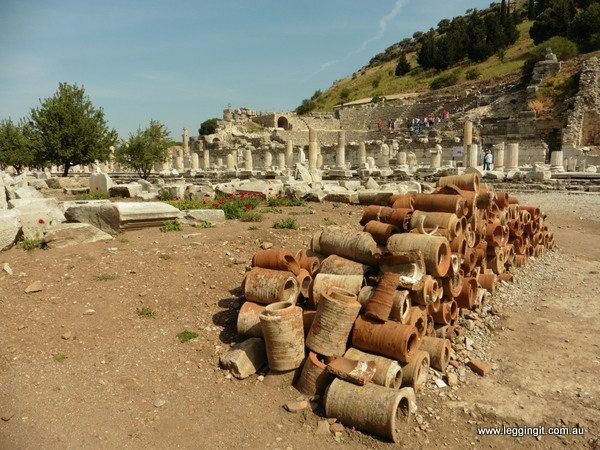 One of the most interesting things about a visit to Ephesus is the ability to wander down the marble Curetes Street. To walk where people walked thousands of years ago, surrounded by the pillars that have been there to see so much history almost gives you the sense of travelling back in time. 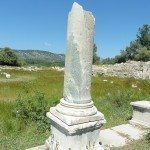 The silting up of the river caused the port of Ephesus to become less important and the marshlands which were created because of the river was the final nail in the coffin. 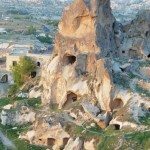 The marshy land became a breeding ground for malaria and by the 15th century Ephesus was eventually abandoned and Mother Nature started reclaiming the city. Some of the city buildings were scavenged for stone and what remained was buried by hundreds of years of dirt. Much of the site has yet to be unearthed and at the moment an archaeological dig is uncovering an old housing district. It’s quite fascinating walking the paved streets surrounded by columns and the remains of temples you can get a real sense of what the city would’ve looked like. We’re so glad that we visited Ephesus after all the other ancient cities we’ve visited because we may have been disappointed in some of the others. 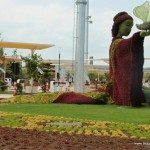 So there are our ideas of, what to do in Ephesus in one day. We hope they help you on your visit and you enjoy it as much as we did. After the best part of the day exploring Ephesus, we headed back to Kusadasi. Tomorrow we may have a chill day and bum around the city. This is such an amazing place! I just left Ephesus and it just blew my mind. 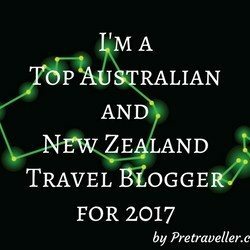 Great post, I hope it inspires others to go as well. I visited Ephesus in 2014. 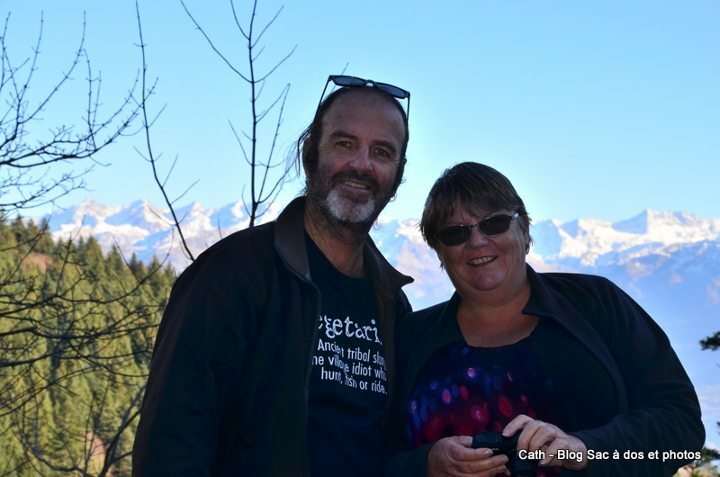 It was a port excursion on our Mediterranean cruise and we also listened to Rick Steves’ audio guides while we were there. It was quite something to be able to go one of the sites of the old 7 wonders especially since I’m doing the new 7 wonders. And that library was quite something. I’d have loved to have seen it in its heyday. Ephesus looks like an amazing place to visit. The city must have been quite something in its time. Walking through the ruins with that sense of ancient history must have been awe-inspiring. 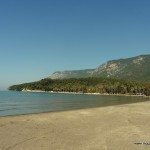 Good tips for Ephesus – I don’t know that people realize how hot and crowded it can be, but as you have noted there are ways to cope with that. I’d add that it is worth the small extra charge to enter the covered excavation/restoration area. It’s a great escape from the crowds, it’s out of the sun, and the painted interiors on display are amazing! Oh wow! This looks amazing and l would love to experience it. It looks so well preserved too. We have something on a smaller scale in Santiponce close to Seville and we visited it a few times. Love it! Yes, it always fascinates me how these things survive all these years. We missed tha tone in Spain will have to try and get there one day. We had a tour there a few years back and truly enjoyed every minute. The advanced plumbing was fascinating. I have to say we must have been lucky because we did not have big crowds, like you show in your photos, when we were there. Thanks for bringing back the fond memories. Yes it really depends on the day it gets especially crowded if there are cruise ships in at Marmaris. Great tip to start at the top! I never would have thought of that. I love the Nike image. She was a very beautiful goddess! 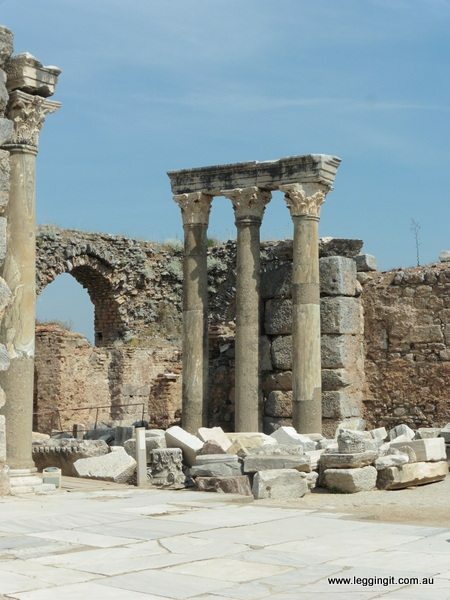 Thx for the great post about Ephesus. 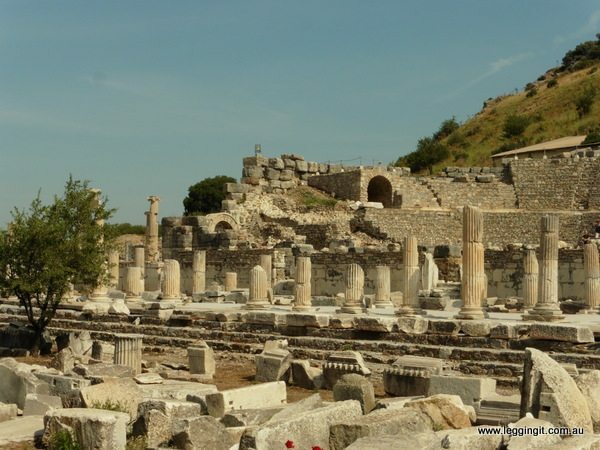 Ephesus seems like an awesome place and definitely worth visiting, Michele. Is a day trip enough to see all the highlights? I was impressed for some reason, at the changed landscape over time – and how far the waterfront is now from the old city. It’s a cool place to imagine historic times. Looks like your visit was during a rather busy time. I would love to be there when it is tranquil. My memories of Ephesus (1972) are rather faded. However, I do remember loving the entire experience. I have always wanted to go back. Thanks for the walk down memory lane. I am glad the post brought back a happy memory for you.